This font was presented to Saint Thomas’s Church by the Earl of Devon, and was used in the church for baptisms up to 60 years ago. Saint Thomas’s Church stood for almost 200 years in front of the castle, on the south side of the square, and its location is marked with the small, low-level wall. The church was united with the Rathkeale Group of Parishes in 1953, was deconsecrated in 1958, and was demolished in 1962. The last Rector of Newcastle West, David Kaye Lee Earl (1958-1962), later became Dean of Ferns (1979-1994) and he died in Waterford last year. Newcastlewest remains part of my group of parishes, but I have to be honest and say I am sorry that the Church closed too many churches in West Limerick in the 1950s and 1960s. I regret, while the Church of Ireland is still present here, we do not have the visible presence that comes with actually having a church building in such a strategic location in the centre of the town. The Courtenay family were mainly responsible not only for providing this font but also for moving the church from its original site at Churchtown to this location in the 18th century. Henry Reginald Courtenay (1741-1803), Bishop of Bristol and later Bishop of Exeter, was the father of William Courtenay who recovered the family title as the 10th Earl of Devon in 1835. Two of his sons, Canon Henry Hugh Courtenay (1811-1904), who later became the 13th Earl of Devon, and Canon Leslie Courtenay, were both Anglican priests, as were the 15th and 16th Earls of Devon. So, the Earls of Devon had a good reason to be benevolent in their endowments of Saint Thomas’s Church, typified in donating this font. But I think, too, of the ordinary, everyday parishioners who were baptised in this font. The vast majority of children baptised in this font were part of the ordinary, every-day life of this parish. They include members of the Curling family, related to Lord Edward Fitzgerald and with exotic stories about the Greek War of Independence in the 19th century. They include the aviator, Sophie Pierce (1896-1939), who was born in Newcastle West in 1896, and who as Lady Mary Heath flew solo from South Africa to London. She died tragically in London at the age of 43, when she fell down the steps of a London tram in a drunken stupor. But Sophie Pierce had the last laugh. At her own request, her ashes were scattered from a plane over Newcastle West – just when her neighbour, a man she never got on with, was taking his midday walk. They are an essential part of the story of Newcastle West, and an essential part of the mosaic that makes us the pluralist and diverse Ireland we are today. And it is appropriate that this font is restored here, so that all who see it are reminded of its original use, reminded of the story of a parish that should not be forgotten, and reminded of our shared stories and shared identities in Ireland today. (Revd Canon Professor) Patrick Comerford is priest-in-charge, the Rathkeale Group of Parishes. He was speaking at the invitation of the Commissioners of Public Works in Ireland at the return of the Saint Thomas’s Baptismal Font to Newcastle West in the Desmond Castle, Newcastle West, Co. Limerick. As the temperature in Limerick reached 30 at one stage on Tuesday afternoon [26 June 2018] while I was indoors at a meeting in Henry Street. Later in the evening, two of us sat out in the rectory garden until long after 10.30, while it was still daylight and as a moon that was almost full was rising above the field to the south behind the walled garden. 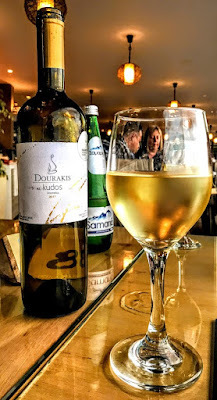 As we shared a bottle of Sauvignon Blanc from Chile, I thought back to my times over the previous two weeks sitting out in the early evening in Crete sharing cool, crisp, palatable white wines. Many of those white wines in Crete were locally produced, and in some tavernas the wine – red, white and rosé – comes straight from the barrel, often produced by the family that runs the taverna. I had written earlier during my holiday about one locally-produced wine in Crete which is made from the Malvazia grape and became known as Malmsey. This wine passed into folklore because Shakespeare says that the Dublin-born Prince George, Duke of Clarence, was drowned in a vat of Malmsey in 1460. 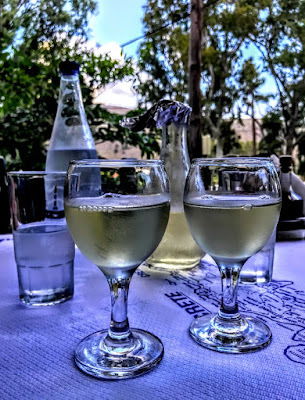 So, it was interesting last week, as the evening was beginning to cool down in Georgioupoli, to be offered a bottle of Malmsey or Malvasia from the nearby Dourakis winery. The name Malvasia may come from Monemvasia, a Byzantine fortress on the coast of Laconia that was known in Italian as Malvasia. But in Crete, wine historians insist the name is derived from the district of Malevizi (Μαλεβίζι), west of Iraklion. The area includes Fodele, said to be the birthplace of El Greco, Palaiokastro and Gazi. The bottle of Malvasia I enjoyed in Georgioupoli last week was part of the Kudos range of wines produced in Dourakis range of wines. The label claimed the word κῦδος (keedos) passed from the works of Aristophanes into the English language in the 19th century, meaning high acclaim or praise for exceptional achievement. I passed by the Dourakis winery one day, and regretted later not calling in. It is close to the village of Vrysses, off the main road between Rethymnon and Chania. The Dourakis family says its ethos and proud tradition is characterised by knowledge, skills and extensive experience in winemaking. The family winery prides itself in creating products of high quality using scientific care and respect of traditional methods. In the last 28 years, the winery has developed quality wines using traditional Cretan grape varieties, as well as international grape varieties, and that that are distributed across Crete. Many of these are organic wines monitored by ΔΗΩ. Aristophanes has been said to recreate the life of ancient Athens more convincingly than any other author. His powers of ridicule were feared and acknowledged by influential contemporaries. Plato singled out his play The Clouds as slander that contributed to the trial and subsequent condemnation to death of Socrates, although other satirical playwrights had also caricatured the philosopher. His play, The Babylonians, which has since been lost, was denounced by the demagogue Cleon as a slander against the Athenian polis. It is possible that the case was argued in court, but details of the trial are not recorded and Aristophanes caricatured Cleon mercilessly in his subsequent plays, especially The Knights, the first of many plays that he directed himself. ‘In my opinion,’ he says through that play’s Chorus, ‘the author-director of comedies has the hardest job of all’ (κωμῳδοδιδασκαλίαν εἶναι χαλεπώτατον ἔργον ἁπάντων). Perhaps Aristophanes alone among the classical playwrights would have understood why Shakespeare had poor Clarence drowned in a vat of Malmsey. But I had better use for my bottle on a warm summer’s evening last week.